There are many options available for people looking to get from one place to another. While walking is always an option, it requires a decent amount of extra time depending on your destination. Cars are popular but many people cannot afford a vehicle and the additional costs of insurance, maintenance and gas. In addition, many people are looking to “go green” and are looking for planet-friendly transportation alternatives. This leaves the ever popular bicycle as a highly used mode of transportation. It is faster than walking and much more eco-friendly than a car or public transportation. Of course, there is a downside to choosing to ride a bicycle and that is the potential for injury. With motorists that do not fully understand how to properly share the road with bicyclists, many accidents happen on a regular basis, leaving many cyclists injured or even dead. For those cyclists fortunate enough to survive an accident with a motor vehicle, the injuries can be catastrophic and even impact the rider’s life for the long-term. That is why it is of the utmost importance to ride safely and utilize the following bicycle safety tips to remain safe on the road. First and foremost, it is a common misconception that bicyclists are not supposed to adhere to the same rules of the road that vehicles do. In reality, both motorists and cyclists follow the same laws and are entitled to the same rights and responsibilities. As a cyclist, this means following all signals, signs and road markings and yielding to crossing traffic when you do not have the right of way. It also means using the appropriate arm and hand signals when turning left or right and when stopping. And, just like motorists, you should always look before you change lanes or turn. Another important tip is to utilize bike lanes and paths if they are available. Many communities have bike lanes and paths marked so cyclists can have a designated area to ride while remaining safe and away from traffic. Remember to follow the direction as marked. It is also highly advisable to wear a helmet when riding a bike. This may not prevent all injuries in an accident, but it can go a long way in preventing brain damage or extensive injury to the head and/or neck. Finally, it is important to stay alert at all times while riding. Hazards on the road can result in accidents and distractions like texting can also prove costly for cyclists. It is also common to end up in an accident after a parked motorist opens their door as you try to ride around a vehicle. Avoiding distraction can provide you with enough time to maneuver or stop and avoid an unfortunate collision. Doing your part to remain safe while sharing the road with motorists will go a long way in keeping you safe from harm and keeping your bicycle intact. Still, accidents happen often, especially at the hands of negligent motorists. 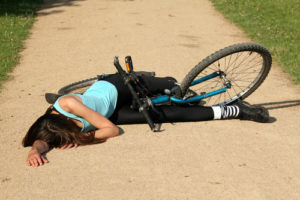 If you or a loved one has been injured in a bicycle accident, you need experienced legal representation. In New Jersey, Blume, Forte, Fried, Zerres, and Molinari has experienced, aggressive and qualified attorneys ready to fight on your behalf. They will do their best to get you the maximum compensation for your injuries. Contact the law firm today at 973-635-5400 to schedule your free consultation.